Below are reports from events where Malvern members and our demo team have attended. check out what we’ve been up to ! The Malvern Demo team performed 3 demonstrations at the 2011 Royal Melbourne Show. 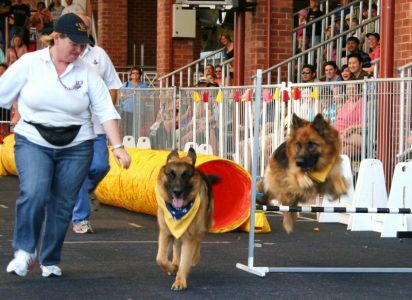 This provided the public with an opportunity to see our GSD’s in action, doing basic to advanced obedience, tricks, tunnels action and other fun. At the end of each demo, the most popular thing for the public was to be able to pat, interact and have photos taken with the dogs – who all loved the attention! Great promotion ! The Handler & Dog stars were Valerie Tan & Matrix, Sherly Narikuzhy & Tessa, Jacinta Poole & Dizzy, Margie McCluskey & Cailin, Chris Mayo & Merlin, Jim Kanlidis & Lira, Grant Milne & Abbi, Gayle Johnston & KCee and Ken Mackay & Barky. The public was kept informed by Announcers Dearne Jackson and Anca Tilea. Great assistance was provided by Helpers Jos Roffey, Rosalie Gerlach, Lindy Kanlidis and Lois Goodes. Excellent photos and videos were taken by Lin Milne, Wai Leng Chu and Jackie Tan Brodin. Below are both images and a quick video package of the demo’s, and the fun that was had ! For more photos see the full slideshows. A convoy of ten cars made their way to the Showgrounds on Saturday 19 September to perform the first of the three series of obedience demonstrations on behalf of the GSDCV. The handlers and their dogs have been preparing for weeks, and this year we have a few newbies who have joined the Malvern Branch demo team. Welcome! 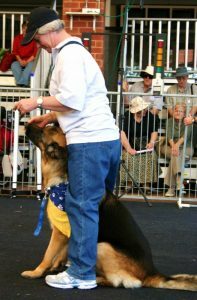 The format of the demo has always been educating the public about the importance of obedience training and then to show how much fun we have with our dogs. The puppy handlers (John & Tiga, Lindsey & Tessa, Clem & Cailin and Lin & Echo) showed how we started training our pups from 8 weeks old. We showed sit, drop, stand and recall plus playing with a toy, then moved oto the tunnels for some puppy play. Whole the handlers may have had initial stage fright, the puppies did what puppies do best – ignored the crowds and just had fun. They were a delight to watch poking their heads out of the tunnels or going flat out into their waiting handlers arms. Once the puppies exited the arena, Julie & Titan. Tom & Polly and Renata & Odin demonstrated the progression from puppy classes to the beginner dogs. We showed the public the importance of persevering with training at this age and that it’s not as easy when the puppy is bigger and more interested in the surroundings. The handlers had to work pretty hard! The senior team came in at the end to demonstrate their capabilities to work with their dogs in a tight group. First timers Anca & Mia and Judy & Emmy joined Joss & Ella, Ken & Barky, Margy & Mishka, Jacinta & Dizzy, Gayle & K’Cee and Grant & Abbi in the ring. Using basic commands such as heel, sit, drop, recall, wait and stay they did some interesting formation work followed by some tricks and tunnels. In general, they showed the public that no matter where you are and what you do, you can always have great fun with a well-trained dog. Rosalie was the caller to keep the handlers on track and following the planned routine whilst Dearne did what she does best – talked about what the GSDCV offers, emphasise why you should train your dog to be a good canine social citizen, and how much fun you can have while training a dog. Our first demo was done in very testing conditions. It rained for the first half of the demo. However that did not stop people from coming over to watch. Our second Saturday demos attracted a big crowd as it was done inside and provided a more relaxed atmosphere for the crowd to stay and talk to team members and take photos. The RASV were very pleased with the success of the demo presentations. Thank you to Dearne who was the MC and organised the logistics for all of us to get there on time. Thank you to Rosalie for calling out the commands to the senior team ensuring a controlled and wonderful performance. Thank you to helpers who helped transport the equipment for each demo from our branch into their cars to the arena then packing it all up and transporting it back to our branch. Thank you to Lois, Georgina, Tom, Larissa and Sue for assisting in the arena and ensuring a smooth transition for all formation work, hoop holding and helping handlers with their dogs whenever required. 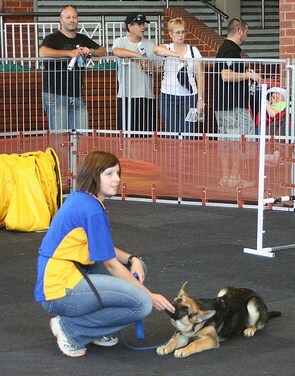 We hope the handlers with the puppies enjoyed their 5 minutes of fame in the demo team and got the taste of demo fun. Taking part is a great way to give the new handlers something to work towards in their dog training as they could see how much control was required and how sound the dogs had to be to cope with the conditions while getting to know some of the more senior members of the branch and instructors who are also members of the team. Our team’s future depends on them enjoying the experience. On Sunday Nov 29, the Malvern Branch Demo team participated in the Rosebud Pet & Pony Show. Though it looked like the storm was threatening to rain down on us, it held off, but it did keep the number of visitors down. The demo team did their usual stuff in the arena starting off with Clem & Cailin and Lin & Echo showing the public how we train our puppies from 8 weeks using positive motivation with toys, food and lots of play. The senior team consists of Gayle & KCee, Ken & Barky, Anca & Mia, Margaret & Mishka and Grant & Abbi. Dearne was doing double duties of handling Barney in the ring as well as commentating. The order of the day for the senior team was all about having fun with our well trained dogs. We won a prize for being the “Most Hospitable Club” which is a great testament to all who participate that day. Thanks to Dearne, Gayle and Joss for organising the logistics, our accessories, and for manning the stand whilst the team were out in the arena. Thanks to Emma (Anca’s niece who is here on holidays) for coming down to help with the stand, taking photos, and distributing our dress-up accessories. We hope you have enjoyed your time in Australia and have some good memories to take back with you to London. The Annual Melbourne Pet & Animal Expo was held on Fri 13 – Sun 15 February, and again the Malvern Branch played host on behalf of the GSDCV as it falls on our turf. 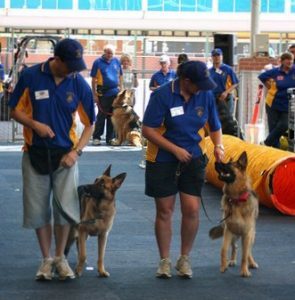 Where ever you went at the Pet Expo there were always the blue and yellow GSDCV (promotions) shirts visible. Thanks to all the GSDCV members who came in to support the stand or do demos (or in some instances Malvern members came in to see the expo and stood still long enough for Dearne to put a shirt on their back!) for being so willing to pop the shirt on. We looked like a united group on the stand and it became obvious to the members of the public that the GSDCV were involved with everything available at the Pet Expo. Almost every session in the main demonstration arena had someone from the GSDCV involved. (Dearne even MC’d the “Gundogs are Fundogs” session on the Friday!) If she had managed to find a small enough shirt to fit Dawn Howard, then we would have had an obvious presence in the Golden Retriever show (held on the Sunday) as well! Themed as Melbourne’s favourite family expo, the event had plenty on offer to all generations. There were animal experts on site to give free pet advice; canine fashion parades, shows and demonstrations; reptiles, cats, ferrets, mice, guinea pigs, rabbits, poultry and bird showcases; an enormous farmyard nursery; coach, pony and amusement rides; live band entertainment; lots of pet products and accessories for sale. 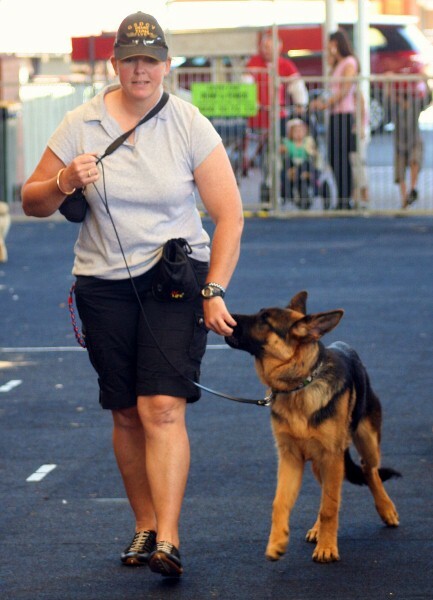 The GSDCV had a stand among the many other dog breeds that were there. Thank you to Dearne Jackson for organising the logistics and planning of the set-up of the stand, rotation of dogs, puppies and their handlers to attend each day, crates in which to rest the dogs, information posters to be displayed and the new GSDCV handout literature printed in time for handing out to the public. On the Friday we participated in the Dogs Victoria “Rangers information” session, helping our Victoria’s municipal rangers understand more about the GSD. Fran Farley and Jacinta Poole participated in the main stage presentation for Dogs Victoria about picking the right breed, while on Saturday, Dearne, Gayle Johnston and Jacinta did this. Everyday and all day, our stand was busy with visitors who are interested in either getting a puppy and don’t know how to, GSD owners who were having trouble or lack training for their dogs or just those who love our breed and who just wanted to know more. Visitors were fascinated by our handsome and beautiful dogs, cute and sometimes noisy puppies, and if not for the rotation of our dogs on the display stand, our dogs would have been worn out with all the pats and photo opportunities! If the dogs were not on display or resting, they were being whizzed off for Ranger or Stage presentations or demos or puppies at play. Being on the stand was non stop, go, go, go as the different presentations came and went. We no sooner finished one activity when it was time for the next to start. This is a testament to the soundness of the temperament of all the dogs that were there. When they were resting, they rested, but as soon as they came out of a crate, they knew something was on and were always animated and up to the task. 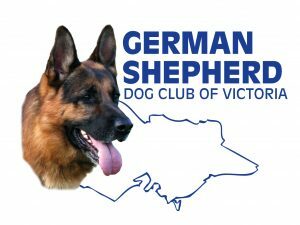 As usual, ALL GSDCV members who came along to help at the stand and/or to be part of the demonstration team were VERY proud to be there representing our club and helping to educate the public about our GSD breed. Thank you to other branches that came to help. The event starts on the Friday and as so many of us work, Marilyn Wrigley, Fran Farley (and Sailor) came in and helped “hold the fort. Marilyn Wrigley returned on the Saturday and Lois Goodes, Bernie Lester, Jenny and Dennis Yuen (and Rocky) joined her so that the stand had enough helpers to ensure there was always someone there ready and available to “talk GSD” to anyone with a question – while the Malvern members went off to do their demonstrations in the main arena or took the five puppies off to the “puppies at play” sessions. We really do get involved in everything available to be done at the Pet Expo! 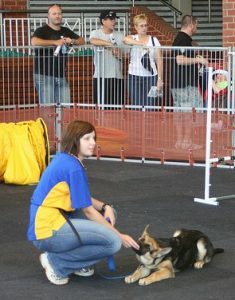 taking Sailor in the ‘Puppies at Play’ sessions, and doing the main stage presentation about picking the right breed for Dogs Victoria. You both must have been exhausted by the time you got home. The Northern branch showed off that their dogs can remember to bring their shopping basket and purse before going out to the shops and also say their prayers before going to sleep much to the amusement of the crowd. Malvern thanks the new puppies and their handlers who participated in the “Puppies at Play” sessions. We hope you have enjoyed yourselves as much as your puppies did. Malvern initiated Margaret and Misha and Gayle with Daisy (morning) and Al (afternoon) as our “future” demo dogs giving a brief display of “starting” a puppy off. Jacinta with Dizzy and Grant with Abbie showed the “learner dog” activities. The rest of the Malvern demo team had their regular dogs (Ken with Barky, Rosalie with Ithor, Joss with Ella) and I was handling Barney on behalf of Dearne Jackson as she was the MC. Our demo was quite action packed with races between Barney and Barky (Barney won this time! Hooray! ), Ithor showed off his retrieving skills (including a diversion through the tunnel before retrieving the dumbbell) and Ella did beautiful spins and weaving. It was a whole lot of fun. Through public display of our dogs at the Pet Expo and providing real demonstration of our dogs working with their handlers, we aimed to educate the public about responsible dog ownership and remove as much as we can the general misconception about our beautiful breeds. We will continue to be involved in public events like this as long as we care and as long as we are still having fun doing it. Stop Press: The GSDCV Breed Stand achieved second place in the Pet Expo Breed Stand competition. The placing was based on how well presented our members were, the posters providing a great visual display, the dogs behaviour on the stand (and being available for the public to interact with) and the quality of the information which was being given to the public. The winning stand was the Bernese Mountain Dog “Lounge room” which really did look lovely – complete with wallpaper, Mantelpiece, fire, lamp and couch. We were proud to come second for all the reasons given above. Pets in the Park is a free family event hosted and organised by the City of Stonnington. As our Malvern Branch is within this council, we are always invited to be involved. There are all sorts of novelty events, stalls representing other types of pets, entertainment, sample giveaways and things to look at and buy. In 2008, the Pets in the Park was held on 15 March at Central Park. We had a stall proudly displaying our Malvern GSD Branch banners, photos, information on our club and breed. Our seasoned campaigners were there again. It was a very hot day but all our dogs were wearing their cool coats and remained comfortable for the entire day. We had a lot of families stopping by for a chat and to pat our dogs. Barney, Barky, Ella, Ithor, Roxy, Abbi, K’Cee, Grubby and Sam were just lapping up all the attention. Read about and see photos on how the day unfolded. A very BIG thank you to Dearne Jackson for organising and setting up our stall. Thanks also to Joss, Rosalie, Gayle, Ken and Grant who came early to help set up. Each year in early February there is a 3 day Pet Expo held at Caulfield Racecourse for all pets. There are demos, displays, stalls, various breed exhibitors and 1000s of people attend. 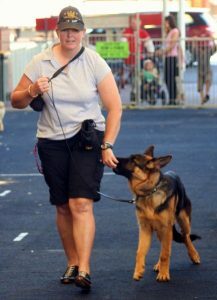 So Malvern are there too to promote the German Shepherd Dogs. In 2008, Malvern were GREAT at The Pet Expo and a BIG thanks to Dearne Jackson for organising everything. The Malvern members who came along and helped with their dogs for the demo were George & Roxy and Grant & Abbi who strutted their stuff for the first time. Together with seasoned campaigners Gayle & K’Cee, Ken & Barky, Joss & Ella, Rosalie & Ithor and Dearne & Barney the crown was most amused. Many of our new puppies – Ollie, Khan, Zara and Heidi also did their stuff in the Puppies at Play. A great socialisation session for the puppies and the crowd. As usual all were a hit. On the indoors stage we had Greg & Melody taking a starring role too. Thanks to Pam, Daniel, Felicity, Ray, Betty and all other who assisted during the sessions.